April was Public Radio Music Month – don’t worry, most people weren’t aware either. Public radio stations around the country were given artists-in-residence for the month, and we were so fortunate as to get Everest. The band has been making some waves recently with a Corona commercial spot; “Let Go” in particular, is a powerful, well-recorded tune. After getting a rough drum sound, I decided to crush them at 4:1, 1ms/100 T2 through my SB-4000 buss compressor with around 10dB peak gain reduction, then slam them (sans subkick) to 1/4″ tape. Since tape compression is non-linear, I turned down the monitors, threw on some headphones and listened to the Otari’s repro head while adjusting faders and EQ’s to design the sound as I wanted it to be. After bouncing it back to ProTools, I combined the crushed version with a blend of original snare, toms, subkick and bit-reduced (distorted) hi-hat. I suppose its important to note that the bounced tracks needed to be nudged back several samples to maintain alignment with the dry tracks, and by the end of the song the machine’s slight speed variance began to evidence itself against the dry snare, so I wound up pulling it down quite a bit by the end. The rest of the kit sounded convincing, at least to me. Here’s a demo of the compressor, which is a very nice DIY unit I like quite a bit. As the mix started to take shape, I found myself dissatisfied with the vocal sound. The vocal take itself was fine, but due to the dual demands of the tracking session I wound up recording it much like I would a typical live session. Given more time, I probably would have put up a few mics to shoot-out and choose from. Anyway, I set up our Fender Twin Reverb, put up a Shure SM7b, Avantone CV-12 (both about 1 foot from the speaker) and a Fathead II (2 feet back), and sent the vocal out the the amp via an aux. While each mic sounded good, I chose the CV-12 for this song. After 6 trips from the control room to the live room adjusting board and amp EQs, I settled on a sound I liked and tracked it. After pulling that in and taking a break, I listened to the song again and tried to get some perspective. On this pass, the guitar solo felt like it could use some beef as the song was trying to build, and my ears were ready for a new and interesting tonality. So I sent the channel out to the amp, tweaked the amp’s EQ and tracked it. After time aligning the doubled track, I was pretty happy with the added weight and aggression given to both the solo and the second half of the song. My attempts to convincingly place instruments in an acoustic space were somewhat hampered by the prominent spring reverberation effects recorded with the guitars. Rather than fight them, I tried to work with them. Part of the vocal sound was created with an automated send to a slap delay with a plate reverb in series, which I shaped with EQ to sound similar to the amp’s reverb. I pushed back the intro and re-intro whistles with a gentle low pass filter, fast attack compression to level out the whistle’s attack, and the same plate reverb as used on the vocal. Another couple hours of tweaking, automating and listening later, I arrived at a point where I felt I couldn’t go any further. I had listened to the song through every speaker or headphone within reach, and the mix had passed my “down the hall” test. While I wanted to keep the mix up on the board overnight to listen with fresh ears, my colleague had a session early the next day, so I was forced to commit. Not a terrible thing, I suppose. I bounced both a “vocal up” and a “vocal down” mix to tape, captured a bounce at 96k/24, exported it and went home. I’m not really a mastering engineer, but sure – I’ll try. Working with 2-track is something I’ve been getting into more as of late, and besides… reading Bob Katz’s book has made me an expert [/sarcasm]. Seriously though, Mastering Audio – The Art and the Science is truly an excellent text which I’d highly recommend, and while it’s impossible for a book alone to make me an expert, it does provide insight on the mastering engineer’s way of thinking. Thus far, I’ve found it immensely helpful in shedding light on the areas that mastering engineers concern themselves with. As a bonus, Mr. Katz is also very active on the Gearslutz forum. The next day I loaded up the file and settled on the 1.5dB down mix, and having reset my ears overnight, I felt that the song would benefit from volume envelope processing. The result was additional dynamic movement in the mix as a whole, which subtly leads me (and hopefully, listeners at large) towards more powerful choruses, solos and finale. The pic below shows the original file with both the mixes. The yellow line is the volume envelope, while has already been applied to the waveform depicted. The waveform on the left is the unaltered “vocal up” mix; you can see the change created by the volume envelope by comparing it to the waveform on the right. 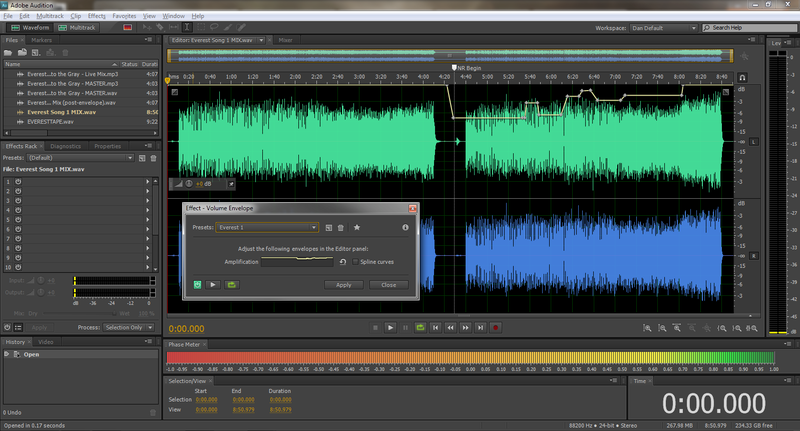 The audio above is the vocal down mix on the right, with the depicted volume envelope applied but without further processing. Some notes on mastering: I approached the master by attacking equalization shaping first, beginning with the mid-range. Then I pulled the low frequency content towards the center, and “aerated” the mix with a few HF shelves. After walking up the level a few decibels with a limiter, some uncontrolled mid-range content then began to reveal itself, which I addressed with one band of a multi-band compressor at a very low threshold and 1.1:1 ratio. When auditioning on a few different playback systems, it seemed that the low end was a bit too heavy, so I shelved it down on the mid channel a few dB. Wanting to keep the subkick energy unaltered, I used the linear phase EQ with a high Q factor to keep the 44Hz range unaffected by the shelf. Because the process is cyclical in nature, it wouldn’t be possible to list off every single change I made. But suffice to say that I used 10 processor plugins, including EQs, filters, compressors and limiters, plus 3 others strictly for analysis. The processing chain ended with Sir Elliot’s Mastering Limiter Series IV, a very transparent, versatile and professional (and free!) tool. While its entirely possible that I’ll have to go and mix and/or master this again, I’m content for now. It seems to communicate the song well, and thus far translates nicely to the various playback media I’ve been able to play it on.